Business premises on the High Street, vacant as of September 2018. 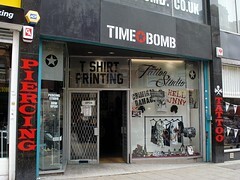 It was previously a tattoo/piercing studio and t-shirt printers called Time Bomb, but this moved around the corner to 22 George Street in August or September 2018 photo of notice. Last edited 2018-10-18 09:43:15 (version 34; diff). List all versions. Page last edited 2018-10-18 09:43:15 (version 34).